The prevention of child maltreatment necessitates a public health approach. In the U.S. Triple P System Population Trial, 18 counties were randomly assigned to either dissemination of the Triple P—Positive Parenting Program system or to the services-as-usual control condition. Dissemination involved Triple P professional training for the existing workforce (over 600 service providers), as well as universal media and communication strategies. Large effect sizes were found for three independently derived population indicators: substantiated child maltreatment, child out-of-home placements, and child maltreatment injuries. This study is the first to randomize geographical areas and show preventive impact on child maltreatment at a population level using evidence-based parenting interventions. An erratum to this article is available at http://dx.doi.org/10.1007/s11121-014-0538-3. A comment to this article is available at http://dx.doi.org/10.1007/s11121-016-0631-x. Child maltreatment (CM) is without question a significant public health problem in the U.S. and elsewhere. In 2005 there were 3.3 million referrals of alleged child abuse or neglect and approximately 899,000 child victims of substantiated child abuse or neglect in the U.S. (U.S. Department of Health & Human Services 2007). CM exacts an enormous toll on society. CM results in costs associated with utilization of administrative services and systems (e.g., child protective services, foster care, judicial system), child treatment services (e.g., healthcare, mental health, educational systems), long-term impact (e.g., psychological and health problems in adulthood), and next generation victimization. Although there is much uncertainty about the cost of CM and its consequences, Prevent Child Abuse America estimated costs associated with child abuse and neglect in the U.S. to be over $94 billion per year in 2001 dollars (Fromm 2001). This figure likely underestimates the cost because it is based only on official reports of child abuse and neglect and does not take into account the cost of unreported maltreatment. The official rates of substantiated CM, and even the referral rates for alleged maltreatment, likely represent only the tip of the iceberg in terms of parenting problems and child adversity because: (a) many episodes of abusive or neglectful parenting might not get reported to or investigated by child protective services (Sedlak and Broadhurst 1996), and (b) much in the way of coercive or inadequate parenting practices may not technically rise to the level of official reports, but could very well have a detrimental impact on child development. For example, Theodore et al. (2005) found in an epidemiological study conducted in the Carolinas that maternal reports of physical abuse from anonymous telephone surveying were 40 times greater than the official child physical abuse reports. Theodore et al. also found that the rate of harsh physical discipline was not significantly different for low-versus high-income households, which flies in the face of the assumption that problematic parenting is only or predominantly associated with poverty. Undoubtedly, CM and associated patterns of inadequate parenting constitute a serious public health problem that warrants strong prevention measures to reduce population prevalence of problematic parenting. The CM prevention field to date has not focused for the most part on prevalence reduction. The research has consisted mainly of intervention studies aimed at treatment of child-abusing parents (Skowron and Reinemann 2005; Timmer et al. 2005), prevention of recidivism among abusing parents (Chaffin et al. 2004; Gershater-Molko et al. 2002; Harder 2005; MacMillan et al. 2005), or high-intensity service delivery to specific subsets of families at pronounced risk for abuse (Cicchetti et al. 2006; Duggan et al. 2004; Fergusson et al. 2005; Rodrigo et al. 2006). Some intervention approaches have demonstrated positive effects with specific clinical or high-risk samples of parents (Olds et al. 2007; Prinz 2007). However, to date no studies on child maltreatment have randomized communities to condition and examined population-level preventive effects of parenting interventions. Most parents never receive any parenting help in dealing with common everyday behavior problems, and few of those who do are exposed to evidence-based parenting programs (Sanders et al. 1999), despite the strength of the evidence for social-learning based parenting interventions (McMahon 1999; Prinz and Dumas 2004; Prinz and Jones 2003; Taylor and Biglan 1998). When few families derive the benefits of receiving an evidence-based parenting program, the potential of parenting programs to reduce the prevalence of problematic outcomes for parents and children in the entire population is diminished, and the value of proven programs becomes limited (Biglan and Metzler 1998). Hence, broader strategies for reaching parents regarding empirically supported parenting information are needed (Sanders and Turner 2002). To address the difficulties of poor population reach via evidence-based parenting programs, a public health approach to improving parenting is required. Reducing the prevalence of coercive parenting in the community requires that a large proportion of the population be reached with effective parenting strategies (Biglan 1995). Thus, a key assumption of a population-based approach is that parenting intervention strategies should be more widely accessible in the community. To achieve this aspiration, a variety of formats, delivery modalities, provider disciplines, and access points need to be invoked. One of the few examples of a public health approach to parenting is the Triple P system developed by Sanders and colleagues (Sanders 1999; Sanders et al. 2002). The Triple P—Positive Parenting Program was designed as a comprehensive population-level system of parenting and family support. This multilevel system includes five intervention levels of increasing intensity and narrowing population reach. The system was designed to enhance parental competence, and prevent or alter dysfunctional parenting practices, thereby reducing an important set of family risk factors both for child maltreatment and for children’s behavioral and emotional problems. The Triple P system meets the standards-of-evidence criteria for dissemination promulgated by the Society for Prevention Research (2004): substantial evidence of efficacy and effectiveness; the ability to go to scale including professionally developed resource materials and a standardized training and accreditation process for service providers; clear and readily available cost information relating to program cost effectiveness (e.g., Mihalopoulos et al. 2007); availability of evaluation tools for providers; and, identification of the conditions necessary to promote program sustainability and quality assurance (e.g., Turner and Sanders 2006). The evidence base for Triple P is extensive. Various components of the Triple P system have been subjected to a series of controlled evaluations, and have consistently shown positive effects on observed and parent-reported child behavior problems, parenting practices, and parents’ adjustment across sites, investigators, family characteristics, cultures, and countries. The substantial evidence base supporting Triple P to date includes 43 controlled trials addressing efficacy, effectiveness, and dissemination, as well as 22 service-based field evaluations (e.g., Morawska and Sanders 2006; Plant and Sanders 2007; Sanders 1999; Sanders et al. 2002, 2004, 2007a, b; Turner and Sanders 2006). An integrated series of controlled outcome studies has provided considerable evidence demonstrating the benefits of the various levels of intervention and modes of delivery in a variety of populations (see Sanders 2008). This program of research has shown successful outcomes with a number of populations and problem areas, with consistent improvement in quality of parenting across studies (e.g., Bor et al. 2002; Sanders et al. 2000; Sanders and McFarland 2000). Triple P has been evaluated as a universal, whole of population strategy and shown to strengthen parenting and reduce the prevalence of conduct problems in preschool-aged children from high-risk neighborhoods (Zubrick et al. 2005), and to reduce coercive parenting practices through the implementation of multiple levels of Triple P (Sanders et al. 2008). Several effectiveness and dissemination studies have been conducted on Triple P demonstrating portability and broad utility in multiple settings (Sanders et al. 2003a, b; Turner and Sanders 2006; Zubrick et al. 2005). Additionally, several independent replications of Triple P implementation and findings in diverse cultural contexts have been conducted (Bodenmann et al. 2008; Cann et al. 2003; Crisante and Ng 2003; Dean et al. 2003; Gallart and Matthey 2005; Heinrichs et al. 2005, 2006a, b, c; Leung et al. 2003; Rogers et al. 2003; Turner et al. 2007). The Triple P system was designed in specific ways for broad and efficient dissemination. The tiered levels of intervention matched to families’ differing needs work well with the public health principle of minimal sufficiency (i.e., the least amount of intervention to solve the problem at hand and prevent future difficulties). Use of the media as a universal tool is another public-health compatible feature. In the Triple P system, a media and communication strategy is utilized extensively in a sophisticated and strategic manner to normalize and acknowledge the difficulties of parenting experiences, to break down parental sense of social isolation regarding parenting, to de-stigmatize getting help, to impart parenting information directly to parents, and to alter the community context for parenting (Sanders 1999; Sanders and Turner 2002). Official CM grossly underestimates the magnitude of the problem. There are many parents in the population who might be engaging in abuse-prone parenting practices, which means a broad strategy is needed for preventive interventions. A preventive approach is needed that reduces the population pool of families who might contribute to substantiated and potential cases of CM. Triple P offers a population-based approach to strengthening parenting. In addition to evidence supporting the effectiveness for various facets of Triple P in improving parenting and reducing children’s problems, Sanders et al. (2008) recently showed how the concurrent implementation of multiple levels of Triple P in a population application can reduce coercive parenting. Although the accruing evidence for Triple P provides justification, it is nonetheless new territory to determine whether a population approach to parenting intervention such as Triple P can have preventive impact on population-level indicators of child maltreatment. This population trial randomizes geographical units (i.e., counties) to condition, matching on demographic and child-abuse variables, and evaluates the impact of implementing Triple P with the existing workforce on population indicators related to child maltreatment (i.e., rates of substantiated child maltreatment, child out-of-home placements, and child hospitalizations and emergency room visits for maltreatment injuries). In contrast to a clinical trial which examines preventive effects at the level of the individual, a population trial targets rates and aggregate dimensions for entire geographic areas. By necessity this population trial gains advantage in studying broad impact but gives up the measurement and methodological precision inherent in clinical evaluation of individual families. However, the impact of Triple P on individual families has already been thoroughly documented in terms of many controlled efficacy and effectiveness studies. There are very few CM-related indicators that lend themselves to population-level measurement and are available across a time period extending for several years. The population indicators chosen for this population trial met several criteria: (1) standardized across counties and delivered to a central repository; (2) measure of CM (substantiated CM cases; CM injuries) or its immediate consequence (child out-of-home placement); (3) associated with significant human and financial costs; and (4) recorded by personnel not involved in the dissemination of the preventive intervention in the population trial. Substantiated CM was chosen over reports because the former is associated with real and potentially costly sequelae beyond the initiation of an evaluation or investigation. The three population indicators chosen for the study had the added benefit of being derived from three separate systems (i.e., Child Protective Services, Foster Care System, and hospitals), which allowed for relatively independent corroboration and documentation of possible preventive effects. The design for the U.S. TPSPT consists of the stratified random assignment of 18 medium-sized counties in a southeastern state to dissemination and control conditions, controlling for county population size, county poverty rate, and county child abuse rate. The conditions were: (1) Triple P System, which involved implementation of the core Triple P system with the existing workforce; and (2) Control, which meant services as usual without implementation of Triple P. Prevention of CM in this design is defined by three population indicators (see Measures section) evaluated after a 2-year period of intervention dissemination controlling for the pre-intervention level. The pre-post randomized design builds in a 2-year period deemed to be necessary to train a sufficient number of service providers in the participating counties and to allow a sufficient amount of time for those providers to deliver the preventive interventions to many families. Using the three control variables for stratified random assignment of counties was intended to reduce initial between-condition differences with respect to population size, which could be correlated with services available to families; poverty rate, which might make it more difficult to achieve intervention success; and child abuse rate, which is related to the outcomes of interest. All of the 18 counties selected for the TPSPT had population sizes between 50,000 and 175,000, and none of the counties had any prior exposure to Triple P at the start of the population trial. Counties were not selected on the basis of community or organizational amenability to participation; and recruitment of providers and organizations did not take place until after randomization of counties. Population size was the main factor in selecting counties to arrive at units that were reasonably comparable by eliminating very small counties that would not have sufficient population to implement the preventive interventions and detect effects, and by eliminating very large counties that would individually account for too much of the overall variance. The counties ranged in demographics from rural to semi-urban. In terms of the broader context, the agencies and services in these counties had suffered significant funding cuts over several years. Although multiple disciplines and agencies served the target population (i.e., families), services often were disconnected, with inadequate referral pathways operating and providers sometimes relying on conflicting approaches. The counties appeared to have little or no prior exposure to evidence-based parenting programs of any kind. For this trial, the referent population in the 18 counties was all families with at least one child under 8 years of age (though because this was a population-level trial, no families formally entered the trial). In the Triple P System counties, this is approximately 85,000 families in any given year. The birth to 8 years child group refers to the target age for assessing preventive effects on CM and was chosen because this is the period of greatest risk for CM selected by the funder (CDC) for the initiative. Separate from the target age for judging preventive effects, however, it should be noted that providers were trained in Triple P for a broader age range (birth to 12 years) consistent with the inherent breadth of Triple P so that providers who straddled the target age (e.g., 5–12 years) in terms of the families they served would find Triple P of greater utility in their work. A key facet of the population-based dissemination of the Triple P system involves the engagement, training, and support of a broad array of service providers from several disciplines and settings including: family support services (social workers and therapists affiliated with county health centers, mental health centers, and schools), social services (family services, social workers), preschool and child-care settings (directors, teachers), elementary schools (parent educators, guidance counselors, kindergarten teachers), non-governmental organizations (e.g., early childhood NGOs, child-abuse prevention NGOs), private-sector practitioners, health centers (primary healthcare providers), and other community entities having direct contact with parents and families. For the 2-year intervention period pertinent to this report, 649 service providers participated in Triple P professional training courses. Demographically, 91.7% of the providers were female, 57.0% European American (not Hispanic), 38.3% African American, 1.3% Hispanic, and 3.4% other ethnic/racial groups, with a mean age of 44.5 (SD = 14.1). Most (81%) of the providers had already been engaged in parent consultation work for at least 5 years prior to Triple P training, and 59% had over 10 years of such experience. The Triple P—Positive Parenting Program, developed by Sanders and colleagues at the University of Queensland, is a multi-level preventive intervention system designed for families having at least one child in the birth to 12-year-old range (the core programs). All programming levels of Triple P have intervention manuals that have been carefully developed, systematic training regimens for providers/practitioners, and coordinated resource materials for parents (videos, workbooks, and tip sheets). The five core principles of positive parenting that are invoked throughout the multi-level Triple P system to promote social competence and emotional self-regulation in children are: (1) ensuring a safe, engaging environment, (2) promoting a positive learning environment, (3) using assertive discipline, (4) maintaining reasonable expectations, and (5) taking care of oneself as a parent. The emphasis is on parents learning how to apply these skills to different behavioral, emotional and developmental issues in children, ranging from common child-rearing challenges (e.g., toileting, mealtime behavior, bedtime, behavior in public) to more intense challenges (e.g., child aggressive behavior, fears and anxiety, ADHD difficulties). The five positive-parenting principles translate into 35 specific strategies and parenting skills that cluster into several major categories: (a) parent–child relationship enhancement, (b) encouraging desirable behavior, (c) teaching new skills and behaviors, (d) managing misbehaviors, (e) preventing problems in high-risk situations, (f) self-regulation skills, (g) parental mood management and coping skills, and (h) partner support and communication skills. Triple P provides developmentally tailored menu options that facilitate parental goal setting and self-regulation. Parents learn how to apply those techniques and strategies that are relevant to their child, the parent’s goals, and the family situation. The Universal (Level One) facet of the Triple P intervention involves the implementation of media and informational strategies pertaining to positive parenting. These strategies are intended to de-stigmatize parenting and family support, make effective parenting strategies readily accessible to all parents, and facilitate help-seeking and self-regulation by parents who need higher intensity intervention. Universal Triple P includes use of radio, local newspapers, newsletters at schools, mass mailings to family households, presence at community events, and website information. Use of local newspapers takes three forms: (1) Positive parenting articles written by Sanders on specific topics of interest to parents; (2) local press releases on human interest stories that link with Triple P activities; and (3) stories generated by reporters with whom the publicity team has developed working relationships. The TPSPT avoided any media outlets (e.g., television) or communication strategies that overlapped with the Control counties. The Selected Triple P program has utility for many parents and is intended to normalize parenting interventions. There are two delivery formats for Selected Triple P: (1) brief and flexible consultation with individual parents; and (2) parenting seminars with large groups of parents. The brief and flexible consultation format involves one to two consultation contacts (20 min each) and is designed for parents with relatively minor and fairly discrete problem behaviors that do not require more intensive levels of intervention. However, this is also a useful and non-threatening strategy to help parents begin to address their own parenting behaviors but in the context of their asking for information or assistance about their child’s behavior. The intervention can be provided in the context of well childcare, daycare and preschool settings, and in other settings where parents may have routine contact with service providers and other professionals who regularly assist families. Selected Triple P can be viewed as a form of anticipatory development guidance. The parenting seminar format of Selected Triple P, called the Triple P Seminar Series, involves three 90-min sessions designed for delivery to large groups of parents. The seminar series includes specific seminars on the following topics: The Power of Positive Parenting; Raising Confident, Competent Children; Raising Resilient Children. The three seminars are independent of each other so that parents can attend any or all of them and still benefit. Seminars are used to promote awareness of Triple P and as brief and informative sessions for any parent. Each seminar includes a presentation, a question and answer period, distribution of a parenting tip sheet, and availability of practitioners at the end of the session to deal with individual inquiries and requests for further assistance. The Primary Care Triple P program, like Selected Triple P, is appropriate for the management of discrete child problem behaviors that are not complicated by other major behavior management difficulties or significant family dysfunction. The key difference is that provision of advice and information alone is supported by active skills training for those parents who require it to implement the recommended parenting strategies. This program level is especially appropriate for parents of infants, toddlers, and preschoolers with respect to common child behavior problems and parenting challenges. Level Three involves a series of four brief (20-min) consultations that incorporate active skills training and the selective use of parenting tip sheets covering common developmental and behavioral problems of preadolescent children. This brief and flexible consultation modality also builds in generalization enhancement strategies for teaching parents how to apply knowledge and skills gained to non-targeted behaviors and other children in the family. The Level 4 program benefits indicated populations of children who have detectable problems but who may or may not yet meet diagnostic criteria for a behavioral disorder, and parents who are struggling with parenting challenges. Parents learn a variety of child management skills and how to apply these skills both at home and in the community. Level 4 combines the provision of information with active skills training and support, as well as teaching parents to apply skills to a broad range of target behaviors in both home and community settings with the target child and siblings. Two different delivery formats for Level 4 Triple P were deployed in the TPSPT: (1) Standard: a 10-session program (up to 90 min per session) with individual families that utilizes active skills training methods, as well as home visits or clinic observation sessions (40–60 min each); (2) Group: An 8-session group-administered program which employs an active skills training process; consists of five 2-h group sessions that provide opportunities for parents to learn through observation, discussion, practice and feedback; three 15–30 min follow-up telephone sessions provide additional support to parents as they put into practice what they have learned in the group sessions. Enhanced Triple P is an optional augmentation of Standard (Level 4) Triple P for families with additional risk factors that might need to be addressed through the intervention. Many families can receive sufficient benefit from Standard Triple P without extending programming with Enhanced Triple P. Enhanced Triple P includes optional intervention modules on partner communication, mood management and stress coping skills for parents, and additional practice sessions addressing parent–child issues. After randomization of counties to condition, recruitment of service providers and organizations took place in the nine Triple P System counties. Service providers were recruited through many settings that provided services to families to participate in Triple P professional training courses. The dissemination staff identified and contacted stakeholders at both the state and local (county) levels in support services for parents of young children, including representatives from a wide range of provider systems such as education, school readiness, childcare, mental health, social services, and health. The staff introduced the Triple P system of interventions to each stakeholder group and organization and then worked with each entity to consider training needs and the ability to deliver parent consultation services (described in more detail in Shapiro, Prinz and Sanders 2008). Communications with prospective service providers and organizations included discussion of how Triple P could be incorporated into existing workplace activities to serve significant numbers of families. Providers who served families in the Triple P System counties were invited to the training courses, and providers in other counties (including the Control counties) were not permitted to undertake the training. The Triple P system has a standardized training and quality-promotion protocol that is used worldwide and was adopted in the TPSPT. Triple P professional training courses delivered by experienced trainers involved attendance at a multi-day training program (2 or 3 days, depending on course level), intensive self-review of intervention materials, competency practice and feedback at a day-long session, and completion of accreditation requirements. The training process included didactic instruction, modeling by the trainer, video examples of discrete skills, small-group exercises for active skills practice, and group discussions of key issues. More details about the Triple P professional training process can be found elsewhere (Sanders et al. 2003a, b; Shapiro et al. 2008). A random telephone survey of households was conducted pre-intervention and again at post-intervention to determine relative growth in public awareness of Triple P in the two sets of counties. The surveys were based on random-dialing sampling of population databases of households where children resided. Response rates for the two administrations of the survey were 42.6% and 49.7% respectively. Respondents who identified themselves as primary caregivers for at least one child under 8 years of age were asked whether they had heard of each of a number of parenting programs including Triple P in the list (query order of programs was rotated across respondents). The number of respondents in the Triple P System counties was 1,794 at pre-intervention and 1,854 at post-intervention, and 1,836 and 1,826 respectively in the Control counties. Follow-up telephone interviews with Triple P trained service providers were used to estimate the number of families to whom programming was delivered. Six months after participating in Triple P professional training, providers were contacted and asked about the number of families they served with Triple P (a) in the most recent 4-week period and (b) during the time since participation in Triple P training. The responses to these two interview questions were converted to annualized figures, which provided an upper and lower estimate of the number of families whom providers indicated had participated in Triple P programming. These estimates are considered to be rough projections, which on the one hand could be overestimates because there is an assumption of constant rate of programming by any given provider, but on the other hand are likely to be underestimates because the data are extrapolated to a 12-month period even though the intervention period was actually 24 months. Three population indicators related to CM served as the outcome variables for this study and were derived from independent data-collection systems deposited with a state-run statistical division. The first indicator was substantiated CM recorded by child protective services staff. These data were unduplicated such that no CM case was counted more than once in a given year. The second was child out-of-home placements recorded through the foster care system. The third was child hospitalizations and emergency-room visits due to CM injuries, which were recorded by medical staff in compliance with mandatory state reporting requirements for hospitals, regardless of whether or when Child Protective Services was involved. All three population indicators were computed as annual rates per 1,000 children in the birth to 8-year-old age range. The two sets of counties were compared with respect to pre-intervention demographic characteristics. At pre-intervention, the Triple P System counties did not differ significantly (alpha = 0.10) from the Control counties with respect to county population, percentage of the population in poverty, and racial composition, and were quite comparable as reflected in Table 1. Pre-intervention levels for the three outcome indicators, calculated as an average over the 5-year period prior to the study (i.e., prior to randomization) for each indicator, also did not differentiate the two sets of counties (Table 1). During the first 2 years of dissemination, a total of 649 service providers in the Triple P System counties received training across the system levels via 69 Triple P professional training courses. A breakdown by discipline and employment for Triple P trained providers is found in Table 2 and reflects wide diversity of individuals and disciplines. Table 2 also shows a breakdown of settings in which Triple P trained providers were working. With respect to level of Triple P, 63.9% were trained only in Levels 2/3 Triple P and 36.1% were trained in Level 4 Triple P or above. About a third of the latter group also received training in Levels 2/3 Triple P, which allowed them to be more flexible implementers. In terms of distribution of providers across the nine Triple P system counties, the mean per-county number of Triple P trained individuals was 38.8 providers per 50,000 population (SD = 14.8), which ranged from a low of 20.9 providers per 50,000 to a high of 60.0 providers per 50,000 population. This broke down into 25.4 providers per 50,000 population (per county) for Levels 2/3 Triple P (SD = 13.7) and 13.4 providers per 50,000 for Level 4+ Triple P (SD = 7.9). Universal (Level 1) Triple P was disseminated widely in the Triple P System counties over the 2-year intervention period. The number of occurrences is summarized in Table 2 for each of the media and communications vehicles. After 2 years of intervention, randomly surveyed households in the Triple P System counties showed significantly higher proportion of awareness regarding Triple P (Mean = 17.1%, SD = 3.5) than did those in the Control counties (Mean = 5.5%, SD = 2.7), t (16) = 7.86, p < .0001. Consistent with this observation, the Triple P System counties showed significant growth in proportion of Triple P awareness from a mean of 4.8% (SD = 1.6) to a mean of 17.1% (SD = 3.5), t (8) = 9.24, p < .0001, while Control counties did not show significant change from a mean of 4.5% (SD = 1.5) to a mean of 5.5% (SD = 2.7), t (8) = 0.95, ns. Based on follow-up telephone interviews with Triple P trained service providers, it was estimated that between 8,883 and 13,560 families participated in Triple P within the Triple P System counties (i.e., totaled across the nine counties and approximately mirroring the distribution of trained providers across the counties). Between 71% and 75% of these families were reported to have received Levels 2/3 Triple P, and the remainder Level 4 Triple P and above. The unit of randomization, county, was the unit of analysis for the three population outcome indicators: Substantiated CM, child out-of-home placements, and hospitalizations or emergency-room visits for CM injuries. Prior to conducting the primary pre-post analyses, preliminary analyses of the three population indicators for the 5 years prior to the TPSPT were undertaken retrospectively to determine if the two clusters of counties showed any pre-study trends or differences. Each population indicator was subjected to a County Cluster (2 clusters) by Time (5 pre-randomization years) repeated measures analysis of variance, and the County Cluster by Time interactions were of particular interest. All three interactions were clearly non-significant: substantiated CM, F(4, 13) = 0.22, p = 0.92; out-of-home placements, F(4, 13) = 1.34, p = 0.31; child CM injuries, F(4, 13) = 1.38, p = 0.30. For each of the indicators, post-intervention rates for the Triple P System and Control conditions were compared, controlling for pre-intervention rate from the year just prior to the initiation of intervention. As reflected in Table 3, differential and positive effects on the Triple P System counties were found for rates of substantiated CM, child out-of-home placements, and hospitalizations or emergency-room visits for CM injuries. The effect sizes calculated as Cohen’s d ranged from 1.09 to 1.22, which are all considered to be in the large to very large range according to Cohen (1988). Although not a primary population indicator in this study, CM investigation rate was examined in a supplementary analysis because some investigators have argued that substantiations and investigations should both be evaluated (Drake and Jonson-Reid 2000). A differential and positive effect for CM investigation rate was found, with a medium effect size of d = 0.51 (significance level notwithstanding because of so few statistical sampling units), t (16) = 1.08, p = 0.15 (Triple P System: pre-intervention rate 18.08, post-intervention rate 18.49; Control: pre-intervention rate 18.74, post-intervention rate 21.91). The U.S. Triple P System Population Trial is the first study of its kind, of which we are aware, to randomize communities to condition, implement evidence-based parenting interventions as a prevention strategy, and then demonstrate positive impact on population indicators of CM. Preventive effects for all three population indicators (substantiated cases of CM, child out-of-home placements, and CM injuries) differentiated Triple P System from Control conditions, taking into account baseline levels. Several design and implementation facets of this study support the proposition that observed preventive effects were attributable to the intervention manipulation. Randomization of counties to condition while controlling for county characteristics (size, poverty level, child abuse level) guarded against threats to internal validity. The two randomized sets of counties were comparable on the dependent variables over the 5-year pre-randomization period, as reflected in non-significant and negligible county cluster by time interactions. Dissemination in the Triple P System counties via professional training, well distributed across all nine counties, and media/communications strategies was extensive and well-documented. Public awareness showed significant differential growth in the Triple P System counties. Finally, follow-up telephone interviews regarding implementation of Triple P indicated that providers reported delivering Triple P to a large number of families (i.e., estimated between 8,883 and 13,560 families). The prevention effect was fairly robust in magnitude. All three population indicators showed large effects, which were also all statistically significant despite only 18 units of randomization. Each of the three indicators was derived from an independently recorded data source, which lends further support to the robustness of the findings. Substantiated CM was recorded by child protective services workers, child out-of-home placements were recorded within the foster care system, and CM injuries were recorded by medical personnel in hospitals. Interestingly, for substantiated CM the preventive effect took the form of holding the growth of CM down in comparison to the control counties which showed substantial growth in CM, whereas for the child out-of-home placements and CM injuries, the preventive effects reflected decreases in those indicators for the Triple P System counties. However, it should also be noted that the increase in substantiated CM in the control counties mirrored similar increases across the other 28 counties in the same state that were not part of the TPSPT, suggesting that the preventive intervention disrupted the trend occurring throughout the state. The real-world magnitude of the observed effects can be derived from the data. In a community with 100,000 children under 8 years of age, these effects would translate into 688 fewer cases of CM, 240 fewer out-of-home placements, and 60 fewer children with injuries requiring hospitalization or emergency room treatment. These types of data lend themselves to a cost–benefit analysis, which is planned for the future and will build on an article recently published regarding the infrastructure cost associated with dissemination in this population trial (Foster et al. 2008). The results of this study demonstrate the feasibility and benefits of implementing a large-scale parenting intervention, using a population-based approach, to prevent CM. The concurrent implementation of all levels of the Triple P system took the form of a workforce development strategy that involved training the existing service providers to use evidence-based parenting interventions, rather than hiring a large number of additional providers. The training was brief (typically 3 to 6 days depending on program level), the dissemination utilized a multidisciplinary workforce of providers who remained in their existing service settings, and many points of access for parents were created. One question that might arise is whether there was a systematic reporting bias in one or more of the three population indicators. With respect to substantiated CM cases, which are reported in a standardized system for Child Protective Services workers, the TPSPT did not involve training of these workers who undertook CM investigations. Furthermore, less than 3% of the providers who were trained in Triple P were employed through social services, which meant that the preventive intervention did not constitute a major presence in that agency. The reporting of out-of-home placements by Foster Care System staff is a relatively concrete enterprise (i.e., either a placement was made or it was not). And finally, hospitalization and emergency room reporting of child injuries were made by medical staff who were not involved in Triple P training. It appears to be unlikely that the observed effects for all three population indicators could be accounted for by reporter bias. The present findings need to be interpreted in light of the study’s potential limitations. First, the indices used to gauge the prevalence of CM, although independent from each other, are relatively gross measures that tend to underestimate the true prevalence of harmful parenting practices. Second, it is important to determine whether effects observed following population exposure to parenting intervention are maintained over an extended time period. However, the Triple P intervention model assumes that effects will continue to the extent that parenting support continues to be available to parents in the community. The approach is not the equivalent of a parenting vaccine, where a single-shot exposure will afford continuing protection for the population. With a mobile population, parents of children at various ages are always entering a catchment area but have no prior exposure to Triple P. A third caveat is the possibility of spillover effects from intervention to control counties. Some Triple P trained providers might have moved to control counties, or families residing in a control county might have received services in an intervention county. Some of the media communications might have spilled over into control counties, although the media vehicles were carefully selected to minimize this type of event. Most importantly, any spillover that might have occurred would have worked against finding an intervention effect of the Triple P system. Additional limitations stem from the fact that this was a population trial rather than a more traditional clinical trial. A population trial in which place is randomized to condition, which is a relatively new or at least uncommon design for the field of CM prevention, is not a gigantic clinical trial. The focus was on training and dissemination on a broad scale and the impact on population-level indicators, rather than on data related to service delivery (e.g., engagement, intervention fidelity) and behavior change at the individual family level. There are practical, methodological, and conceptual reasons for not trying to collect these kinds of data. On the practical side, conducting a clinical and a population trial at the same time would have taken considerably higher resources. Methodologically, attempts to collect individual-level data might have been intrusive for organizations, providers, and families, which might have invoked reactance and possibly created obstacles to full dissemination. Finally, from a conceptual perspective, a large body of evidence on Triple P has already established effectiveness (including intervention fidelity and transportability), which provided a sound foundation on which to build the population trial. That said, there is still a big need to conduct studies on how to increase engagement of families in preventive intervention contexts. Effect sizes are important for deriving policy implications from population trials such as the present one. It is important to note, however, that the effect sizes observed at a population level should not be confused with effect sizes for individual families or children found in more traditional trials conducted at the level of the individual. The population-level effect sizes reported here, which appropriately treated county (not individual) as the unit of analysis, should only be compared to other population-level effects reported in the literature, and not to individual-level effects. Similarly, the effects observed for individual-level trials cannot and should not be assumed to correspond to or predict population-level effects, and in fact the effect-size values from those trials might translate into smaller effect sizes when recalibrated to apply to a population rather than a selected sample. From a policy standpoint, population level effects are of primary importance (Nilsen 2005). Population trials are new to both the parenting intervention and the CM fields. There is much to learn about how to conduct and interpret population trials, and to better understand what is needed to sustain or enhance effects on prevalence indicators. Some of the challenges discovered during this effort include: (1) the need for unobtrusive but systematic ways to track the occurrence of other programs and interventions in the communities; (2) how to determine what levels of program penetration of the population are required to attain particular levels of impact on population indicators; (3) unobtrusive strategies for tracking density of program delivery; and (4) the need for surveillance procedures for characterizing the size of the existing workforce in a community that is serving parents and families. The latter issue is more difficult than it might appear. In the TPSPT, the dissemination drew on many different types of providers across a wide variety of settings, but there was no master list of providers. There are registries of licensed professional in a county (e.g., all licensed social workers), but this information would be misleading because many of the social workers might be serving other populations besides families of young children, such as the elderly or the terminally ill. In addition, many of the providers who can deliver Triple P work in less traditional settings and come from a broad variety of disciplines. This trial provides an excellent opportunity to enhance the field’s understanding about population dissemination. As such the trial should be viewed as the beginning of a line of population research in the prevention of CM, from which we can expect to learn much over the next several years. All things considered, this study provides an encouraging demonstration that evidence-based parenting interventions can achieve population-level preventive impact on major social problems such as CM. Furthermore, the study’s findings support the utility of blending prevention of CM and promotion of child and family well-being in a public health strategy (Carmona 2006), with the Triple P system providing an integrated model for this approach. The research described in this paper was supported by Grant #U17/CCU422317 to Prinz and Sanders from the National Center for Injury Prevention and Control, Centers for Disease Control and Prevention. The authors wish to acknowledge the contributions of Douglas Levine and Wilma Sims to the research effort. The findings and conclusions in this article are those of the authors and do not necessarily represent the views of the Centers for Disease Control and Prevention. Sanders, M. R., Ralph, A., Sofronoff, K., Gardiner, P., Thompson, R., Dwyer, S., et al. (2008). Every Family: A population approach to reducing behavioral and emotional problems in children making the transition to school. 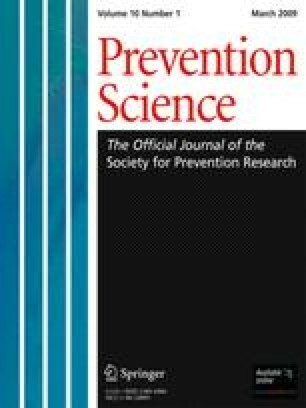 The Journal of Primary Prevention. doi: 10.1007/s10935-008-0139-7. Shapiro, C. J., Prinz, R. J., & Sanders, M. R. (2008). Population-wide parenting intervention training: Initial feasibility. Journal of Child and Family Studies. doi: 10.1007/s10826-007-9170-1.